For those of you that follow, ever since an incredible pelagic trip with Westport Seabirds in July, 2010, I have had a bit of a run of bad luck, having had 3 trips in a row since then cancelled due to weather (Jan '11, Sept '11, and Jan '12). In fact this January Nathan Hentze, Jeremy Gatten, and I ended up all the way down in Ocean Shores prior to the cancellation of the trip, but still enjoyed a couple of rarites (see my post "The Longest Twitch"). My brother and I were keeping our fingers crossed from start to finish. We lucked out early on, getting the second to last spot on the Coho despite showing up two and a half hours early for the 10:30am sailing on Friday morning. The crossing was very quiet, with very few birds and no pelagic types present. From Port Angeles, we headed south along Highway 101, enjoying the scenery and the odd bird enroute to Ocean Shores, where we planned to hunt down a number of vagrant shorebirds that had been reported recently. incredible blue-green, my pictures do it no justice. We really didn't run into anything of interest until we pulled into Ruby Beach, a unit of Olympic National Park. We were greeted by Chestnut-backed Chickadees, and a little surprised when we set up our scopes and quickly noticed a line of Sooty Shearwaters moving north to south, and we estimated 3000 in the 15 minutes we were watching. Also at Ruby Beach, our first Brown Pelican of the trip (and apparently my Jefferson County life tick, if I were keeping track!). We took the long way around to get to Ocean Shores, making the turnoff onto the Moclips Highway. The detour proved very worthwhile, as we encountered a stunning male Ruffed Grouse along the highway. The Game Range at Ocean Shores was our first stop, as Ruff and Sharp-tailed Sandpiper had both been reported the day before. Unfortunately for us, a Peregrine Falcon had the same idea, to go looking for shorebirds! We located a good number of Pectoral Sandpipers, Western Sandpipers, Dunlin, Greater Yellowlegs, and a single Baird's Sandpiper, but nothing with an accent. From there we checked out the Ocean Shores Sewage Treatment Plant followed by the Point Brown Jetty, but only succeeded in adding my first for Washington Northern Shoveler, an American Pipit, Savannah Sparrows, and a seemingly endless stream of Brown Pelicans. The next morning we were up early and at the dock, greeted by a harbour covered in fog, and assurances that it wouldn't last. The boat loaded and the lecture given, we headed out into the harbour and the ocean beyond. We immediately found more Brown Pelicans and various mutt gulls. 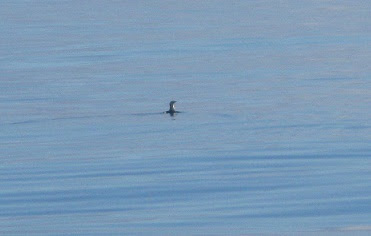 Soon, Common Murres began to show, followed by Sooty Shearwaters. Eventually we came upon a fin sticking out of the water, which created a buzz among the birders on deck, many commenting on the shark we had come across. 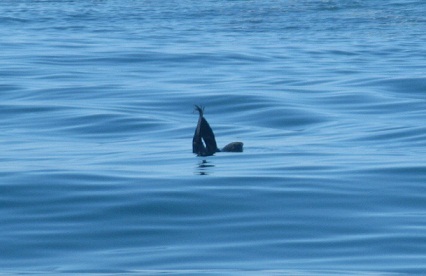 It wasn't, however, a shark showing us its fin, but something much, much better! This fairly distant shot would almost make a good quiz bird. 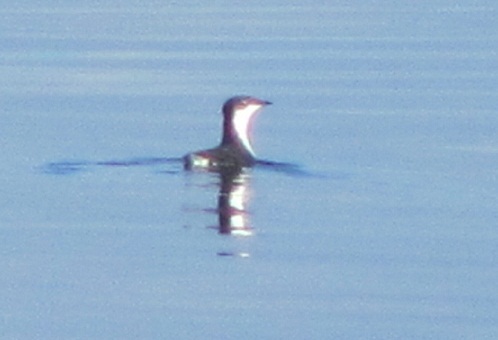 Here is a heavily cropped picture that my brother got of the Scipps's Murrelet, of which everyone on the boat got incredible looks. Scripps's Murrelet is a recent split, having formerly (up until a couple of months ago) comprised one half of Xantus's Murrelet. The Northern population was split off as Scripps's, while the Southern population, which shows white above and in front of the eye, became Guadalupe Murrelet. I believe the bird pictured above is the first Washington record since the split. In short order we added Sabine's Gulls, Pink-footed Shearwaters, Black-footed Albatross, Fork-tailed Storm-Petrels, and a couple of Pomarine Jaegers, plus a very distant Buller's Shearwater, before stopping well offshore to chum. The chumming brought in few birds, due in no small part to the lack of wind. From there, Captain Phil decided to chase after a shrimp boat that we had seen in the distance. The shrimp boat hosted a large crowd of birds, mostly Northern Fulmars and California Gulls. With time running short, we turned in the general direction of Westport, having taken a long detour to chase the "Jackpot". On the way back in we finally got good looks at a Buller's Shearwater that cut right beside the boat, and then the boat stopped quickly for a log. Wait, a log? This Northern Fur Seal put on a show for us, stretching in every way possible and peering at us over its body.﻿ We added a mystery shark, and as we got closer to shore we ran into more shearwaters including another Buller's Shearwater, this one perhaps only 3 miles offshore. We also ran into a very early Yellow-billed Loon, and a bit of nostalgia - a cloud of Common Terns being chased by Parasitic Jaegers. For some great pictures from the trip out of Westport, and many other pictures of Westport, Washington, and other birds, you can also check out Ryan Shaw's Flickr Page. After returning to the dock we headed first to Bottle Beach, where there were no shorebirds, and then headed for Midway Beach south of Grayland, where we spent almost 2 hours on a wild Snowy Plover hunt. There were good numbers of dowitchers, Sanderling, and Pectoral Sandpipers (including a couple of very bright individuals), and an American Bittern that my brother spotted in the reeds. As the sun set over Midway Beach, we finished up with dinner at the One-eyed Crab. Sunday morning found us headed to Bottle Beach as soon as it was light enough to see. We had no problem finding the shorebirds we were seeking, and we quickly located Western, Least, and Baird's Sandpipers, Black-bellied Plovers American and Pacific Golden-Plover (one of each), Short-billed Dowitchers, Sanderling, Red Knots, and a large squawking mass of Marbled Godwits. We had scanned the beach up and down a couple of times when a small group of peeps flew in, and with them a larger bird, a juvenile Ruff. Later in the day, after we had departed to ensure our passage on the Coho, a female Bobolink was seen and photographed along the trail at Bottle Beach as well. Our return trip was very uneventful, and the Coho trip from Port Angeles to Victoria was even quieter than the trip down. All in all though, it was a great trip, huge thanks to Westport Seabirds (and to Capt Phil, Chris, Bruce, Bill, and Ryan!) and to everyone who posts to Tweeters for the timely sightings! I found one of my targets (Buller's Shearwater) plus another bonus lifer in Scripps's Murrelet. I am not sure when my next Westport Trip will be, but I am definitely looking forward to it!